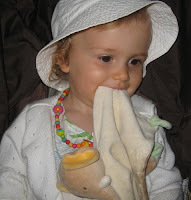 Cottontails Baby: Remember the elephant comforter..? A couple of weeks ago I wrote about the lost elephant comforter and the couple in the US who moved heaven and earth to obtain a replacement as quickly a possible. Well, today I was delighted to receive a follow-up email. Marie, the mother, wrote to tell me that her little girl, Clemence, was ever so pleased to see her elephant again, and didn't mind one bit that he was a bit cleaner and newer than the one she used to have. You can see how much she loves him in this photo - and apparently he tastes quite nice too! A very happy ending.